Jetbull.com is an impressive online gaming brand that offers the largest selection of online casino games and sports betting facilities. The casino was established in 2007 and is operated and managed by EveryMatrix Ltd. Jetbull Casino is fully licensed and regulated by the Malta Gaming Authority and the British Gambling Commission. All the games in the casino come from popular and trusted brands like Microgaming, NetENT, Betsoft, Play'n GO, NYX, IGT, OMI Gaming, EGT, Booming Games etc. A wide range of live casino games, virtual sports, and live lottery games are the other eye-catching features of Jetbull Casino. The casino also features an extensive sportsbook that covers all major sports and a vast number of betting types. Also, Jetbull ensures a great gaming experience by instant payments, a wide range of promotions, and loyalty rewards. The safety and security mechanisms adopted by the casino to protect the details of their customers is commendable. Users can experience the Jetbull Casino in one of three offered languages, which are English, Russian, Spanish, German, Turkish and Swedish. When it comes to the user interface design of the website, it should be admitted that Jetbull has done an extraordinary job in creating a pleasing gaming portal. The colour combinations, thumbnail arrangements, and vector graphics are assiduously mixed together to create the perfect interface for an exciting casino experience. Jetbull Casino also has a team of responsive representatives in the customer care unit to take care of any problems faced by their customers. All the newcomers at Jetbull can take advantage of their exciting welcome bonus and earn points towards cash rewards. Jetbull revamped their welcome bonus and it now includes a double whammy with your first deposit. Firstly, you'll receive a massive 100% bonus up to €300, which is activated by your initial deposit. In order to receive the welcome bonus, your first deposit should be €10 or more. In effect, this offer doubles your first deposit, so place €150 in your account and play with €300. And, when you play for at least €/£100 on mobile games you will also receive 200 free spins. The free spins will be available on all mobile-friendly NetEnt slots. 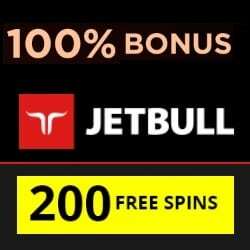 If the welcome bonus merely isn't enough to motivate you to try Jetbull, then the free spins package they offer with your first deposit should certainly do. Different other promotions for the existing players are also run frequently on the website. The current promotions ongoing on the website include €35 Weekly Reload Bonus, Casino Cash Rewards, €10 Multiple Bonuses and many more. Are you sportsbook fan? Good news for you! Jetbull Sports offers you a €20 free bet bonus when you place your first bet via mobile. Claim your free chips by sending an email to [email protected]; or through Live Chat with bet ID of the bet that qualifies for the offer. One will be really impressed with Jetbull’s range of games, with upwards of 2000 gambling products, including a number of live tables, a bingo room, lotteries and even a sports book. Their slot selection alone is enormous, giving players the opportunity to enjoy over 1250 different video slot titles. These include some latest additions like Emoji Planet, Shangri-La Cluster Pays, Starburst, Jungle Spirit, Thunderstruck II. etc. Well, if want to play the best slots, here is the place that makes you happy. Mega Moolah, Hall of Gods, Mega Fortune, Major Millions, and many other progressive slots can also be found on Jetbull‘s website. Every spin on jackpot games gives you a chance for a super mega big win over 1,000,000 euros! Table game lovers can find themselves in front of a wide collection of virtual games like Blackjack, Roulette etc, that too in different variants. The Live Casino at Jetbull has a user-friendly gaming interface that brings the real-life casino directly to your gaming console. Live Blackjack VIP, Live Baccarat Gold, Live Roulette Professional and High Roller Texas Hold'em are one of the most popular table games with real dealers in the casino. Other games in the casino represent the following categories: Scratch Cards, Video Poker, Fun Games and Virtual Sports. In this respect, we can suggest trying Keno, Bingo, Backgammon, Super Wheel, and Cribbage. Jetbull Casino has an abundant list of payment options available that has the potential to satisfy all the gamers who sign up.Both deposits and withdrawals can be made via Visa, MasterCard, Skrill, Paysafecard, EcoPayz, Trustly, Przelewy24 etc. The deposit methods are generally free of charge and are processed instantly. Meanwhile, the processing time of withdrawals may vary and can take as long as 5 working days. Being a fully licensed casino, Jetbull automatically adheres to the strict norms and regulations levied by the UK, Malta and EU Government. SSL encryption technology is implemented on the website to ensure that all your personal and financial information remains confidential. All games are run through a verified Random Number Generator which means you can expect payouts at 97,8% and above. The customer support at Jetbull is second to none, with support options available to players in the form of Live Chat, Email, and Telephone. The casino also has an active Facebook and Twitter page where you can stay in touch and get information on the latest promotional offerings. The website also hosts a great FAQ section where the answers to your most common questions can be found. The hundreds of thrilling games and excellent gaming environment are just a few of the many reasons for players to join Jetbull. In short, if you are looking for an online casino that offers high-quality games, promotions, and freebies in a safe and enjoyable environment, then Jetbull Casino is the perfect choice for you. Overall rating score for JB: 9,5/10.